Gibberish is unintelligible, nonsensical, or meaningless language. Similarly, gibberish may refer to speech or writing that's needlessly obscure or pretentious. In this sense, the term is similar to gobbledygook. Gibberish is often used in a playful or creative way—as when a parent speaks to an infant or when a child experiments with combinations of vocal sounds that have no meaning. The word itself is sometimes used as a term of disdain for a "foreign" or unknown language or for the speech of a particular individual (as in "He's talking gibberish"). Grammalot is a particular type of gibberish that was originally used by medieval jesters and troubadours. According to Marco Frascari, Grammalot "consists of a few real words, interspersed with nonsense syllables mimicking the sound utterances to convince the audience that it is a real known language." La la la lo lo. Inky tinky pobblebockle abblesquabs? — Flosky! beebul trimble flosky! — Okul scratchabibblebongibo, viddle squibble tog-a-tog, ferrymoyassity amsky flamsky ramsky damsky crocklefether squiggs. "God what a husband I'd make! Yes, I should get married! and cover his golf clubs with 1920 Norwegian books . . .
Lt. Abbie Mills: Chopping down a Christmas tree? Ichabod Crane: Altogether a nonsensical concept. Celebrating Yuletide with a titular display of lumber. Lt. Abbie Mills: Wow. Bah-humbug to you too, Ebenezer. Ichabod Crane: That was all gibberish. - "The exact origin of the word gibberish is unknown, but one explanation traces its beginnings to an eleventh-century Arab named Geber, who practiced a form of magical chemistry called alchemy. To avoid getting into trouble with church officials, he invented strange terms that prevented others from understanding what he was doing. His mysterious language (Geberish) may have given rise to the word gibberish." - "Etymologists have been scratching their heads over [the origin of the word gibberish] almost since it first appeared in the language in the middle 1500s. There’s a set of words—gibber, jibber, jabber, gobble and gab (as in gift of the gab)—that may be related attempts at imitating incomprehensible utterances. But how they arrived and in what order is unknown." 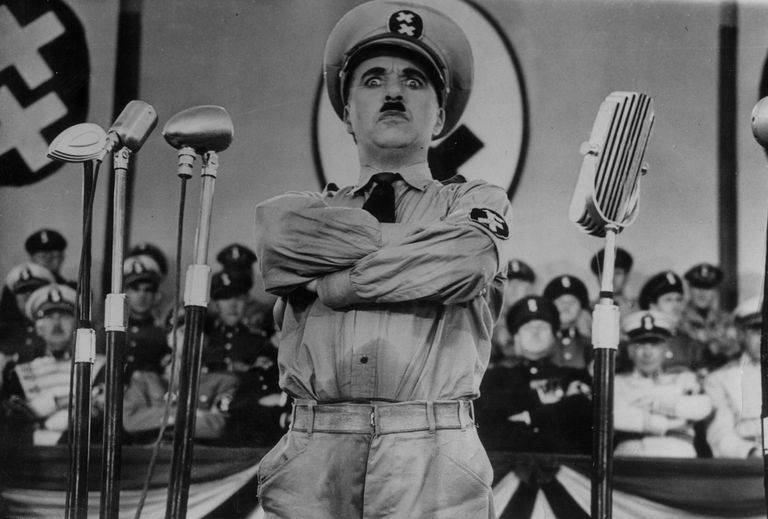 - "[Charlie] Chaplin's performance as Hynkel [in the film The Great Dictator] is a tour de force, one of his greatest performances of all, and certainly his greatest performance in a sound film. * He is able to get around the arbitrary and limited 'meaning' which dialogue implies by screeching his vaudevillian German doubletalk of utter gibberish--the result is sound without defined meaning...the finest weapon by which to satirize the disturbing and disturbed speeches of Hitler as seen in the newsreels." - "Gibberish captures that foundational static out of which wording arises...[I]t is my view that gibberish is an education onto the relation of sound to speech, sense to nonsense; it reminds us of the primary phonetic noise by which we learn to articulate, and from which we might draw from again, in acts of parody, poetry, romance, or storytelling, as well as through the simple pleasures of a disordered semantic. Democrazie schtunk! Liberty schtunk! Freisprechen schtunk! Chaplin's nonsensical enactments throughout the film highlight language as a material susceptible to mutation, appropriation, and poetical transfiguration that no less delivers potent meaning. Such oral moves on the part of Chaplin reveal to what degree gibberish may perform to supply the thrust of speech with the power of critique." "If you said to someone, John store to the went, they'd think it was gibberish. "Language that makes no sense. "No stopping me now. I said, Store the to went John. Does that make sense? Of course not. So you see, you have to have words in their proper order. Proper order means meaning and if you don't have meaning you're babbling and the men in the white coats come and take you away. They stick you in the gibberish department of Bellevue. That's grammar." Homer Simpson: Listen to the man, Marge. He pays Bart's salary. Marge Simpson: No, he doesn't. Homer Simpson: Why don't you ever support my gibberish? I'd do it if you were stupid.